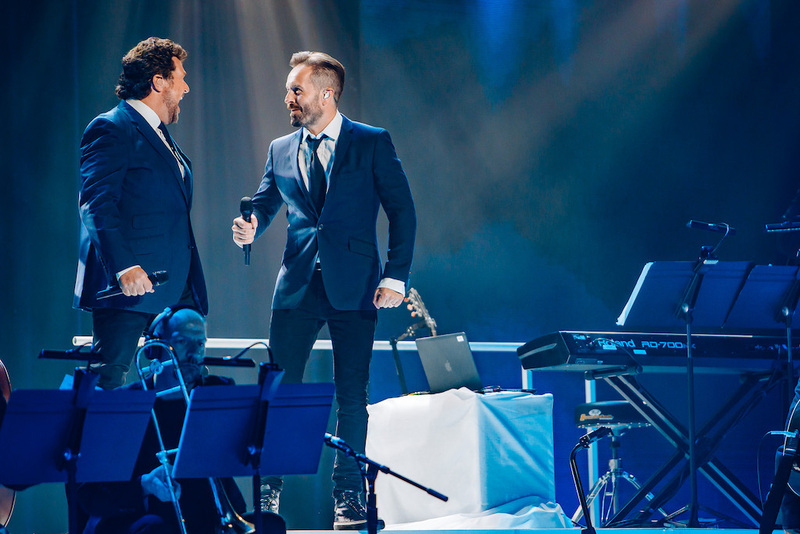 Acclaimed singers in their own right, Michael Ball and Alfie Boe are even better Together, a fact Melbourne fans can attest to after last night’s boffo concert at Hamer Hall. Ball, who has played Hamer Hall before, is the West End’s most famous male star, having originated such roles as Marius in Les Misérables, Alex in Aspects of Love and Caractacus Potts in Chitty Chitty Bang Bang. A more recent success was the title role in Sweeney Todd opposite Imelda Staunton. Boe made his Melbourne debut last night, but is known to local audiences from his towering performance as Jean Valjean in the 25th Anniversary Concert of Les Misérables. Back in January 2003, Man in Chair was fortunate enough to see Boe as Rodolfo when Baz Luhrmann’s production of La Bohème played on Broadway. It was Kismet indeed when Ball and Boe met back in 2007 whilst performing for English National Opera. 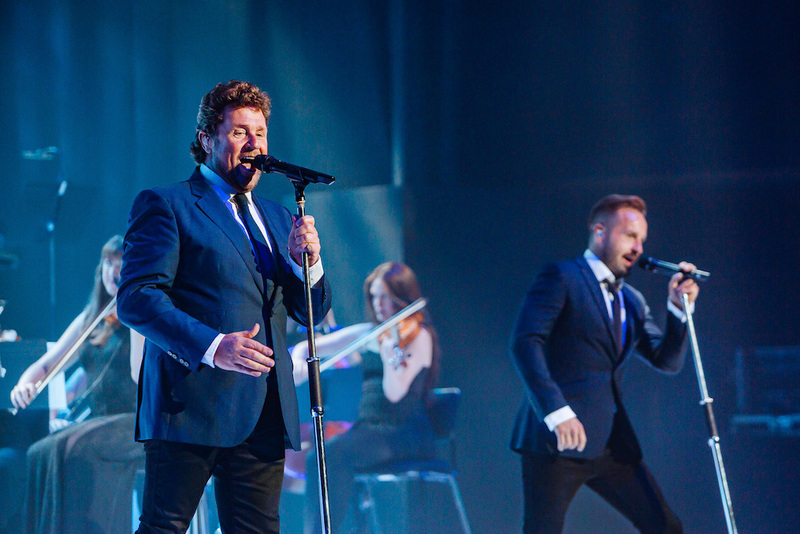 Their album Together was the UK’s highest selling album last year, and the pair has come Together Again for a follow up album. Such is the quality of the duo’s voices, a pot plant and a grand piano could well have been sufficient staging. 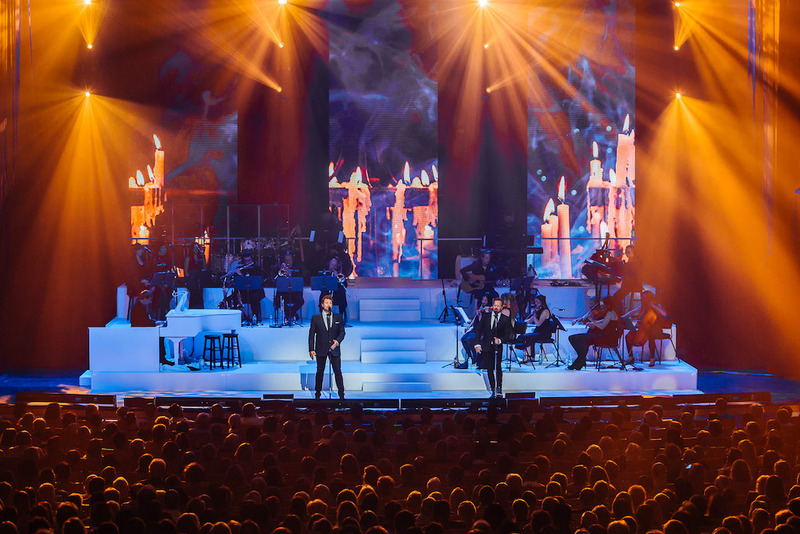 In a bonanza for fans, the tour is actually produced on a lavish scale, with a 15-piece orchestra, three female back-up singers, tiered set, full height rear vertical LCD screens and spectacular lighting. Ball has a natural tenor voice that is characterised by rich warmth; when he sings it always sounds like he is smiling. With a background in opera, Boe has more of a ringing head voice, backed up by beautifully burnished notes in his lower range. Similar concerts have seen two male stars simply alternate between each number; Ball and Boe, however, really do sing together. The result is a stunning sound, rich in close, beautifully blended harmonies and eloquently echoed phrases. Ball is the alpha of the pair, charming the audience with his enthusiastically friendly nature. He first half of the program opened with an up-tempo arrangement of “Tonight” (West Side Story), the first time Man in Chair can ever recall clapping along in time to this tune. A superb arrangement of “Music of the Night” (The Phantom of the Opera) beautifully displayed the blended quality of the men’s voices. Ball shared his reminiscence of deciding to follow a career in theatre after seeing Jesus Christ Superstar when he was twelve years old. 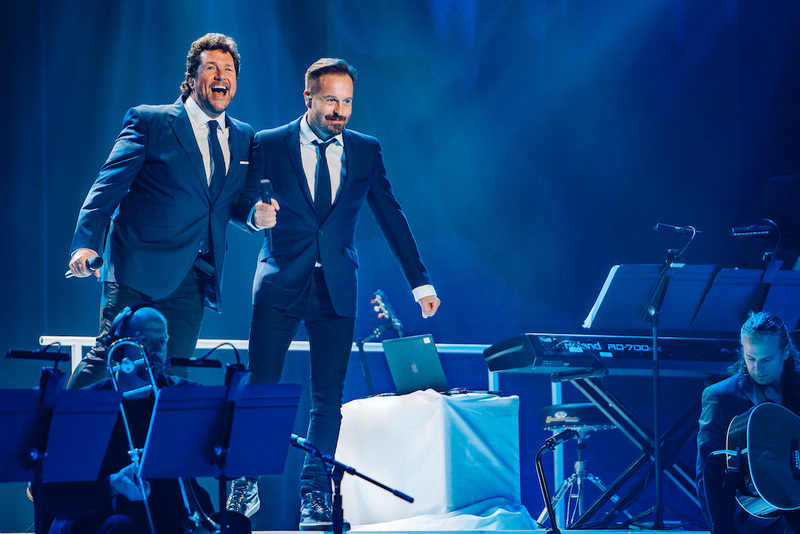 Ball absolutely brought down the house with Superstar’s epic prayer “Gethsemane.” Giving a cheeky impersonation of composer Andrew Lloyd Webber, Ball introduced his biggest musical theatre hit “Love Changes Everything” (Aspects of Love). Boe returned to the stage for the pair’s tribute to Les Misérables, the legendary musical that has brought them both so much success. Ball and Boe professed their love for each other several times, a love that was well and truly shared by the audience, with multiple standing ovations on this highly memorable occasion. 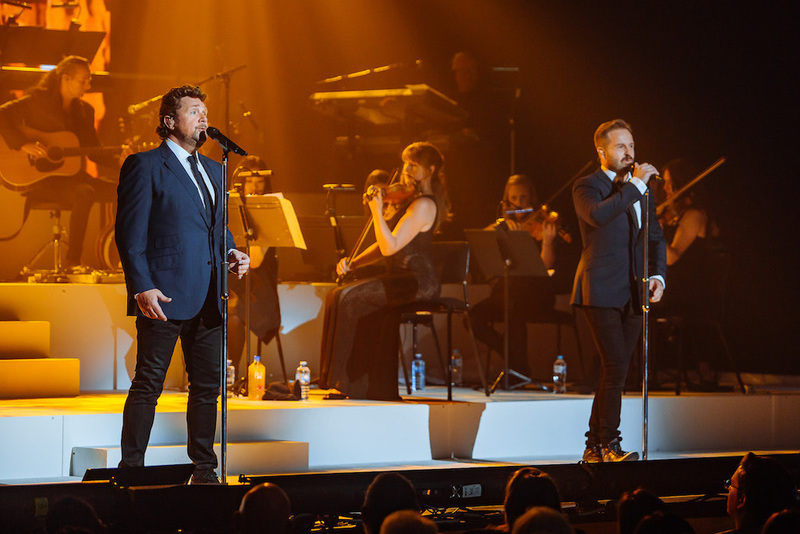 Michael Ball and Alfie Ball Together played at Hamer Hall, Arts Centre, Melbourne 8pm Saturday 7 October 2017. The concert plays Sydney 11 October, Adelaide 14 October and Perth 16 October 2017. I was at the concert in Brisbane on Thursday and it too was brilliant . They are wonderful, separate and together! Thank you for that lovely review! Thanks Clara. So glad that Michael & Alfie visited Australia!